In the second part of the Antiques through the Ages guide, we will cover three styles of the late 1600s. Carolean and William and Mary were two English styles during this time while Louis XIV reflected the French style. The Carolean period is the last of the three Jacobean styles and is commonly referred to as the Restoration Period. When King Charles II returned from exile and came to power, he reversed Oliver Cromwell’s very plain style. He incorporated more of a French influence into the English style after being in France for his exile. This furniture period was also influenced by the Dutch, Spanish, and Italian. Furniture included more elaborate carvings and colorful upholstery and was lighter than previous styles. With carvings more commonly incorporated into furniture, walnut became more popular than oak because it was easier to work with for scrolls and curves. In addition to carvings, applied decorations of pendants, roses, and grapevines were added to furniture. Geometric designs were more common for drawers. During Charles II’s reign, the typical decoration for chairs was a crown and cherubs, but while his successor James II ruled, furniture commonly had palm leaves instead of cherubs. Chairs saw a significant transformation during the Restoration. High-backed chairs replaced those of the Cromwellian period and commonly had scrolled legs and stretchers. Until this point, chairs were not frequently used, but after 1660, they were used as seats at the table. 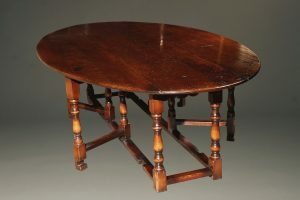 In addition to the prominence of chairs, the gateleg table was introduced during this era. The William and Mary period was largely influenced by the Dutch because of William II, who brought craftsmen with him to England. Other influences included Flemish, French, and Chinese. Furniture commonly featured Oriental lacquer work–called “Chinoiserie”–showcasing the influence of the Chinese. Chairs continued to go through transformations. 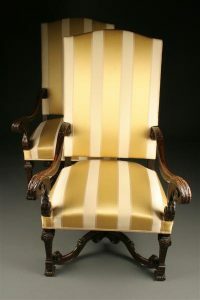 Comfort and luxury became a greater concern than before, leading to improved upholstery techniques. 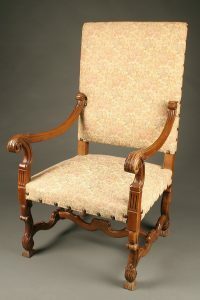 Chairs had taller and rounded backs, which also helped to make them a more comfortable fit. Trumpet-turned legs and X-stretchers were popularly used to provide more stability. 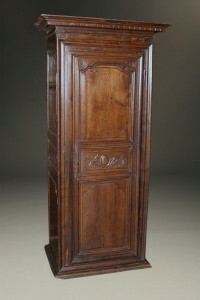 William and Mary furniture makers continued the trend of using walnut in their pieces for the ease of carving. A few different techniques and trends emerged during the William and Mary period. Dovetailing enabled craftsmen to build furniture with thinner boards, and veneering was introduced as well. The trend of a comfort- and luxury-oriented focus resulted in the production of dining tables, easy chairs, and desks. Designs transitioned away from the rectilinear trends of the Jacobean era; the rounded chair backs with carvings resulted in a softer look. The Louis XIV period was one of grandeur with elaborate ornamentation, quality workmanship, and a dignified look. In previous eras, furniture pieces often served multiple purposes, but during the Louis XIV period, furniture became more individualized with more specific uses. 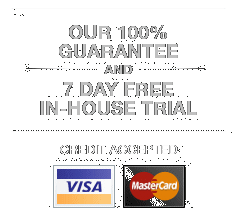 Popular furniture forms during this time were commodes, mirrors, and chandeliers. Chairs ranged from high-backed padded armchairs to stools; one piece that fully embraced the Louis XIV style was the upholstered armchair. Decorations typically consisted of carvings that were gilded, often in gold. Crimson, green, and dark blue were commonly paired with gold leaf. Early in the period, furniture was heavy but as the period progressed, the sizes got smaller, which increased the appeal. Craftsmen typically used chestnut, walnut, or oak for large pieces. Boulle, one of the period’s prominent craftsmen, created a technique of inlay or veneering with contrasting materials, typically using tortoiseshell, ebony, and brass.